Lately, I've been drooling over all of the pumpkin recipes I've seen online. There are SO many different creations that people have come up with! I knew I wanted to make something that Levi could eat, too. We love making and freezing pancakes for low maintenance breakfasts. Why not make pumpkin pancakes?! I found this recipe on tasteofhome.com, and made a couple changes to make them a little healthier. They are just as good without the syrup. I enjoyed them most with a little butter and no syrup. Also, I like the flavor when I use coconut oil to cook them. In a small heavy saucepan, cook butter over medium heat for 5-7 minutes or until golden brown, stirring occasionally. Add the maple syrup, cinnamon and nutmeg. Remove from the heat; stir in nuts. In a small bowl, combine the flours, sucanat, baking powder and salt. In another bowl, whisk the eggs, milk, pumpkin and cheese. Stir into dry ingredients just until moistened. Drop batter by 1/4 cupfuls onto a greased hot griddle; turn when bubbles form on top. Cook until the second side is golden brown. Serve with maple butter. Here is how I like them :) Actually, I think I'll add some Greek yogurt and berries the next time. 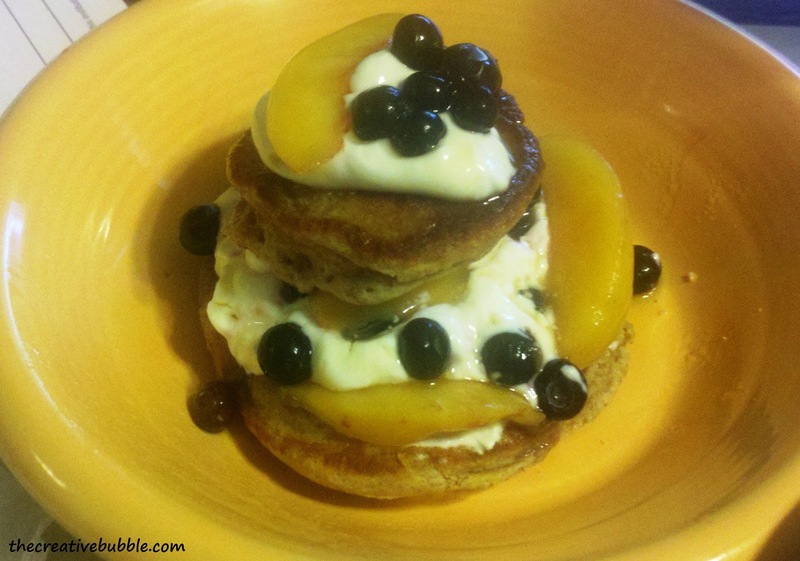 This isn't a good picture, but I love stacking pancakes with Greek yogurt and berries between each layer. Looks Yummy! Thanks for the follow. I am now following back. I wanted to be sure that you are aware the New Year's Exchange on mine and my daughters page is not a Blog Hop. It is an exchange we are hosting. Linking your post up to it confirms you are joining in on the exchange. Please read over the rules and let me know that you understand them. Hey, thanks for the follow as well. I'm so sorry! I was confused when I "linked up" to your exchange. I did link up to the weekend social mix blog hop from your friend's page. So, thanks for hosting that party! Sorry for the confusion.